Dieter Rencken is an independent Formula One journalist, having covered the sport for the last 20 years. Dieter specializes in the politics and commercial side of Formula One and has, until recently, contributed to major motorsport publications like F1 Racing and Autosport. From this season onwards, Dieter has taken up the challenge of working with the independent motorsport news website www.racefans.net in addition to supplying his German, French, Australian and Russian outlets, travelling to all F1 races. In this interview, he looks at the changes the sport underwent in the last 20 years and the impact that Liberty has made since its arrival early last year. He also talks about the difficulties for young drivers to move up the motorsport ladder and the three biggest issues F1 is currently facing. You became a full-time F1 journalist at the age of 40. Why did you take that decision and what did you do before? I have had a lifelong love for Formula One. All I wanted to do was work in the sport and initially, I believed that my engineering and marketing background would be a good help to find employment with a team. So, at 40, I finally took the plunge and moved to the UK. I was quickly disillusioned to discover that as a South African I couldn’t get a work permit in the UK. To earn my living, I ended up selling advertising for Haymarket (editor’s note: the company that publishes Autosport amongst others). There, I found out that I was eligible to stay in the UK if I worked as a foreign correspondent for a newspaper. As I knew the editor of the South African paper ‘The Citizen’, I asked him if I could write a race report provided he could get me an accreditation. And that’s what happened. What was your first F1 race as a journalist and what do you remember about it? That was Silverstone 1997. I had never worked as a journalist before, so when I walked into the media centre, I was completely lost at first. I sat at a table, came back the next day and found my seat had been taken. So I sat somewhere else and a French guy came and said ‘that’s my place’. Only then did I understand that there were name stickers for the tables! Also, the Internet was rather difficult these days, so I had to send my race report by fax. But when I left the circuit after that race, I thought that even if I’d never get accreditation ever again, I had it at least once in my life. Today, 298 grands prix later, I can say that probably I didn’t do too badly when I wrote that first race report! How has Formula One changed over the last 20 years until the end of the Bernie Ecclestone era? It has totally changed. 1997 was the start of the commercial rights story with Bernie acquiring the rights from the FIA. He was also extremely suspicious of the developing Internet. He believed he owned the electronic rights because when he bought those rights, electronic media covered TV and radio. So the Internet became this vague area. Is it another form of printing or electronic media? A massive court case between F1.com and Formula1.com with Bernie then paved the way for the acceptance of the Internet and today, nearly every publication also has an Internet platform. Another big difference was that in 1997 there were 26 very noisy V10 cars on the grid. It was the start of the (modern) Ferrari era, drivers like Nigel Mansell were leaving and young drivers like Michael Schumacher coming in. It was also the end of the tobacco era and the start of manufacturer era. At the end of the 1990s, Bernie also started his Digital+ TV, which at the time, didn’t take off but helped to improve terrestrial TV coverage. Good TV coverage led to people wanting to read about the sport, which in turn helped the print press. When Liberty took over, were you surprised how quickly it happened? Yes and no. Liberty had been talking to CVC for a couple of years already, so they had done an element of due diligence. Subsequently, it transpired that possibly they didn’t have sufficient knowledge to do a proper full due diligence. It was clear that CVC had to sell because the investment period was coming to an end and they had to return the funds they had received from investors. I wasn’t surprised that the deal happened. I think what took everybody by surprise was that once they had completed the deal, Bernie was literally gone that day. Would you say Liberty’s work in F1 after one year has been positive overall? Well, if it is positive to allow teams to use social media for their own footage, then possibly yes. But what have they really done? They tickled F1 around the edges. They banned grid girls, big deal. The Australian GP this year will essentially be the same than last year. Ok, there is the new TV streaming deal. But the fundamental flaws of F1 are still there and will be until the end of 2020. Have Liberty underestimated the complexity of the sport? I think they have underestimated the level of resistance from all parties about changing contracts which cannot be changed until 2020 unless all parties agree. Maybe Liberty thought that for the good of the sport Ferrari or Mercedes would give up a portion of their bonus, but that is not going to happen. And why should it? All the big teams have tailored their operations around certain levels of income. So if you threaten to scrap an 80 million dollar bonus a year, of course there will be resistance. For an operation like Ferrari, F1 is its marketing pedestal. If you take the 80 million dollar bonus away, the money still has to come from somewhere. So it will come out of profits. Ferrari can’t afford that, so they’ll leave F1. Just because they have said it many times before and have not left doesn’t mean they won’t leave now. Looking ahead and beyond the end of the current Concorde Agreement in 2020, will F1 change considerably over the next few years? First of all, there is no Concorde Agreement. One of the other major changes since I started is that F1 no longer has a Concorde Agreement in place. The tripartite agreement outlined the obligations of the teams collectively, the commercial rights holder – which used to be Bernie Ecclestone and now is Liberty Media – and the FIA. It was replaced in 2013 by bilateral agreements between the teams individually and the commercial rights holder, with a separate agreement between the commercial rights holder and Formula One Management (FOM) serving as an implementation agreement. What are the current problems in particular? Fundamentally, the three flaws are the governance, the technical side which is weighted in favour of the manufacturer teams, and the financial side which, again, is weighted in favour of the big teams. Looking at the technical side, why would a team like Mercedes give up their current technology if it helps them sell their road cars? Trying to do away with that probably means you are chasing the manufacturers away. We already looked at the financial side. These teams need x amount of money to keep their doors open. And if they don’t have that amount, they’ll close their doors. So it will be a fraught negotiation period. But the biggest problem is that the current governance process and revenue structure should never ever have been introduced in the first place. I blame CVC for these inequities because they planned on listing F1 on the stock exchange. It didn’t happen but they needed some headline signings to be able to go to the markets and say ‘look, we have Mercedes, Ferrari etc. under long-term contracts till the end of 2020’. That was in 2012. So they were able to plan seven or eight years ahead but by the time 2020 had come, CVC would have been out of F1 because they would have sold it on the stock exchange right away, like they did with Samsonite. I am certainly not a doom and gloom monger but the future of F1 will be fraught. It won’t be an easy ride. Are you worried that Liberty will turn F1 into an American politically correct show? There is nothing wrong with a bit of razzmatazz if it is adapted to the various countries and their customs. If you are in Japan, you might not buy into this boxing ring-type driver presentation. But it doesn’t affect the racing. On the contrary, if it attracts fans to a specific GP, that’s great. Back in the late 90s and early 2000s was it easier or harder for a young driver to enter F1? It was probably easier because there were 26 cars to start with. Also, testing was unrestricted, so a driver could get a testing contract and have full-time employment. Today, they are just walking around the paddock and if they are lucky they maybe do a few test days a year. Before, you got into a smaller formula, you could develop your car until it became a winner and you moved up the ladder to F1. Today, the smaller series are almost all exclusively single-make chassis, engines, and tyres, meaning no development. So a young driver today moves through the ranks, gets to F1 and becomes a test driver, having never tested a single car! The same is true on the engineering side. You had small teams that developed their cars well and moved up the series ladder. That’s how Eddie Jordan or Peter Sauber ended up in F1. That doesn’t happen anymore. So it is increasingly more difficult, both for drivers and team owners, to come into F1. The single-make concept has been introduced to keep costs at bay. Otherwise, it would be even more difficult for young drivers to get into F1. So what is the solution? Let me ask a question: Why is it that since the FIA sold the commercial rights to all of their series that costs have become a problem? Before 1997 teams tested all over the place, all year. Well, it comes back to having a commercial rights holder who wants to make a massive profit. Also, is motorsport, all the way up the ladder, offering the right return on investment to sponsors today? I am not convinced that this is the case. If we had an influx of sponsors throwing money at F1 the way the tobacco companies used to for example, then costs wouldn’t be an issue. Cost only became an issue after the sponsors left. So how do you get the sponsors back? You have to offer a superb package of entertainment. To do this, you need to address the current issues that the sport is facing. Since this inequitable revenue structure has been introduced in 2013, not a single team outside the top three has won a GP! One also has to ask why, in the early 2000s, were there seven big manufacturers in F1 and today they are just three and a half? Well, take a manufacturer’s F1 budget of about 300 million dollars. That’s not a huge amount of money for companies turning around six to ten billion dollars a year. Their marketing budgets are huge, too. So money isn’t the issue. Plus they can recover a lot from their sponsors. Mercedes do this well and therefore F1 is a cost-effective marketing platform for them. But when those companies look at the return on investment now with TV viewership numbers having dropped from 700 or 800 million per race to approximately 360 million, that means that half of the return is gone out of the window. So whereas before a 300 million dollar budget for a manufacturer was justifiable, now they can only justify 150 million. Where is the rest going to come from? What about the relation between Liberty and the media and access to the races? How has the relationship evolved since they have arrived? They are called Liberty Media, so it is very difficult to separate the two. It has become marginally easier to get accredited, but let’s not forget that the passes for print and online media are controlled by the FIA whereas electronic media has remained under Liberty’s control. So from that perspective, there has been no change. An important positive change though is that Formula One finally has a full-scale media department. There are now press people at the circuit all the time and the media knows who to talk to! In the past, you had to send Bernie an email! And sometimes he felt like replying, sometimes he didn’t…. However, I can see an issue arising with the F1 trademark. Bernie allowed certain publications to use F1 in their name for which they either paid or printed the party line. Liberty Media, as owners of the F1 trademark and as a media company, might possibly be clamping down on this use in the near future. There are a lot of publications having F1 in their domain names so that might provoke some issues. There might also be a clampdown on broadcaster passes as the streaming concept grows but I don’t think this is going to happen for some time yet. How do you see the current TV development with the loss of free-to-air TV coverage in particular? It is a problem if the streaming system will not fill the gap. 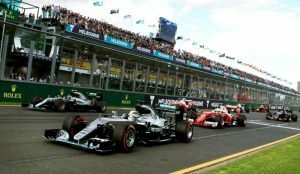 F1’s revenues are at about 1.8 billion dollars, split into 600 coming from race hosting fees, 600 from broadcasting and 600 from paddock club licensing fees. If Liberty manages to convince 400 million people to pay 12 dollars a month for the streaming service, that would be an income of 4 billion! If that happens, Liberty could afford to give the teams half, which would be 30% more than what they are getting at the moment. So the future of F1 hinges on whether or not the streaming deal will take off. And if it does, the future of F1 will be bright. However, Liberty needs to invest first. At the moment they are asking the teams to accept less money. It must be the only company on earth that is asking its suppliers to drop their prices so that they can invest in their own company’s future! The digital TV idea is not new. Bernie tried to develop it at the end of the 90s but it didn’t work. Why was that and what’s the difference with Liberty’s streaming system? At the time, Bernie was forced to sell through TV broadcasters as that was the only transmission available. Today, Liberty is trying to sell through Netflix-type transmissions, meaning they can sell directly to the consumer. The TV broadcasters at the time all had free-to-air service, so selling Bernie’s digital product was contradictory and therefore didn’t work. The other reason is that the world simply wasn’t ready for a digital product like that. It was a great idea but probably about 10 to 15 years too early. The tragedy was that once Bernie’s fingers were burnt, he was reluctant to re-introduce new technology. So TV technology stayed the same for many years. HD-TV for F1 coverage was only introduced in 2012! And Bernie only accepted because satellite TV stations like Sky threatened to leave F1 if he didn’t! In the current climate, would you recommend any young person to become an F1 journalist? When I came into F1, I literally lived in a tent and only covered European races. It took three years before I started to make a reasonable living from my F1 work. So all I’ll say in closing is that it still beats working, but you pay for it in passion!